When we live life in slices, in moments, we value and honor each day. If we get stuck in the past replaying what’s happened again and again or in the future wishing or worrying of what’s to be, we miss the power that we have in this very moment to make different decisions, to find and be peace, to dream and do bigger, to push ourselves beyond the fray and excuses to attain our best selves. Some moments are sweeter than others, but they all culminate to define who we are, where we are going, what’s most important and who we choose to be with on the journey. Someday is today with all of its imperfections and beauty. Slice into each moment, moving step by step into who you are meant to be. As I was getting ready for my 20 mile run yesterday morning, I kept telling myself – time and distance, time and distance. It’s not about speed, but about running long enough to get the mileage in. I was apprehensive about my ankle and missing two long training runs over the past two weeks. After the first 5 miles, I settled in, let go, listened to music and just ran. Nothing existing before or after, steeped in the flow of the movement, in the moment. When I hit 16 miles, I could feel the wear on my body but knew I would complete it. The last 4 miles were run by my heart. After a long hot shower, gratefulness and contentment set in, something I was short on the past two weeks. My ankle demanded rest, my head argued that I would lose three months of training capacity if I took a break for however long it for my ankle to heal. Luckily with the encouragement of friends and family, the work of my chiropractor and massage therapist/friend and rest, I finished. Sometimes we need to rest. Sometimes we need to push through. Most times we need to do both. It’s the ebb and flow of life. And most of all, when we tire when we are so close to finishing, we need to let our mind rest and run with our heart that tells us we can do it, we have it in us, keep going. Anything we pursue in life requires our whole person to be on the same team – our body, mind, heart and spirit. Our heart and spirit are fueled by faith. And often times our body and mind stray, leaving the heart and spirit to finish the job. And when we put the time in, we will go the distance. This week, I have been arm-wrestling with patience. I strained my ankle last week and I’ m off on my training schedule. Not too far, but off plan just the same. Pretty minor in the overall scheme of things, but after three months of training, I’m frustrated with a side of self-pity and crabby. It’s easy to be positive when the world is going our way. The real test is in pain and disappointment. And if we take our eyes off of ourselves long enough, we can receive the gifts that trials offer including a deeper level of empathy for others. We’ll see how long it will take my pep talks to transform my attitude, but I’m going to keep trying until it clicks. And it’s really about how we go through our trials that show our real character. Patience is called for once again. If it could only move a bit quicker and on my schedule. Still working on it, obviously. We are three weeks out from Grandma’s Marathon, hence the 20 mile run. Last year, my brother ran his first marathon. 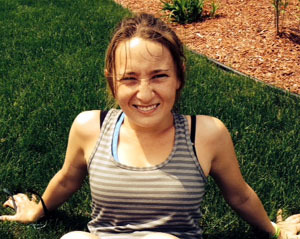 This year, my niece Emily is running her first marathon. I am training for my third marathon in October, inspired by many who have gone before and encouraged by friends and family. Each of us can and are called to inspire, encourage and be encouraged by others. Yesterday, I ran 13 miles of Emily’s 20 mile run, mostly behind her of course. It was in the low 80s most of the run. It was a hot one. John and Tina followed along on the bike with water, Gatorade and a cow bell. I remember my first marathon and am so excited for Emily to experience the fruition that comes from the seeds she’s planted, the work she’s done to get here. While it’s an important part of the training plan, the 20 miler is more important mentally than physically. It give us the confidence and reminds us that all the work over the past three months will pay off and we have it in us to finish 26.2 miles. We’ve done the work, now enjoy the ride. We often need to overcome our own definitions, limitations and perceptions of what’s possible, to believe in what we are made of and to act on it. Whether it’s a marathon or another dream that’s written on your heart, pursue it vigorously, put in the work and know that you have it in you to finish the race. At the marathon this weekend, it was inspiring to hear about the amazing accomplishments of the front of the pack – finishing in 2.5-3 hours. I was happy to finish and improve a bit on my first marathon. The real inspiration came for me as I walked back from the finish line to see family and friends at mile 25. Runners were still finishing, pushing through, six hours on the course. According to marathon “rules,” the course closes at six hours and you must clear the road. Runners at that point were told that they could finish on the sidewalk but they were unofficial and it didn’t count. Wow! How often do we hear or say that to ourselves or others? In our daily lives, by actions, inactions, expressions and words, we have the power to inspire or deflate. Never discount anyone. What you do and say matters – choose wisely with kindness and love as your compass. 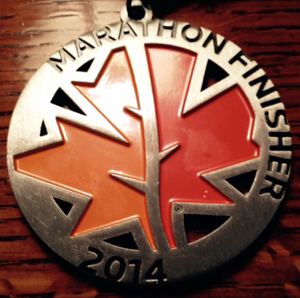 Eight months ago when I decided to do my second marathon, I was very excited at the idea. I then proceeded with the training, taking it seriously, following a plan and overall I felt great. At 48, I am in the best shape of my life. Yesterday, I did the work to prepare, to finish strong. I rested and drank extra water on Saturday and Sunday, well-hydrated, I thought. All week, the meteorologists predicted pouring rain all morning. 8:00 am start – blue skies and mid 40s, a perfect running day. It usually takes me a few miles to warm up. Mile 6, I was achy and had a headache. My brother John had dropped me off, parked near the finish line and biked back to meet me at mile 10 on the course. Mile 13, I told him I felt like I was tanking, only half way there, and I thought, “I may not make it” but I turned up the music and pushed on. I took some more electrolytes and kept going. Mile 16, calf cramp and light headed. Mile 17-20, a few light showers followed by an ankle and groin cramp (first time for this one, delightful). My legs felt like stumps. John kept riding ahead, stopping, getting off the bike and clapping as I went by. At one point, a woman looked at me and asked my name, I told her and she yelled, “you can do it, Kathie!” At least one of us believed it. 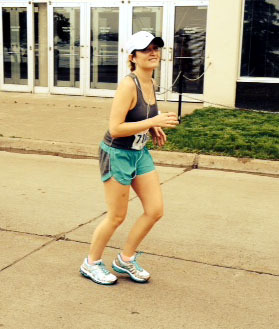 At mile 21, I knew I would finish even if I crawled in on all fours. 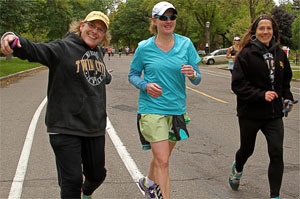 Friends and family were gathered at mile 25 so my goal was to see them, be upright and smiling. My niece Emily surprised me coming back from school (3 hours away) to be there. Right down the line, hugs and kisses for friends and family. Emily ran me in the last mile with John still riding along the side, the longest, slowest bike ride he’s ever done. Mile 26.2 – done. Amen. Walking back up the hill to mile 25 to see family and friends, I figured I’m too old for this. Where did I go wrong? I described what happened on the course and Terry asked, “did you drink more water than usual?” – Sure did, needed to be hydrated. Well, it turns out, you can drink too much water – the official term – hyponatremia – I washed all of the electrolytes. He did the same thing on one of his marathons. All the symptoms matched with what happened on the course, with the exception of seizure and death. Glad I missed those. While I wanted to finish strong, I endured to the finish. Life is about showing up, trying, failing, getting back up, trying again, giving, receiving, fun, faith, family, friends – all those gifts that describe the past four months that culminated yesterday morning. Choose your “marathon” – whatever that is and pursue it with all you have.